Stamp collecting is easier and more fun when you have the right tools to help you organize, identify, and handle your stamps. Storage - Stamps can be stored in something as simple as a shoe box, but placing stamps in an album allows you to display your collection. You can buy an album or make your own. Tongs - Tongs look like tweezers, but have a smooth gripping surface designed to handle stamps. Using tongs keeps the oil and dirt from your fingers from damaging the stamps. 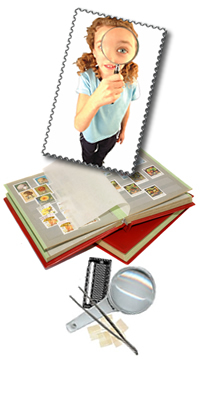 Magnifying Glass - A magnifying glass is a great tool to help see the details of your stamps. Some stamps appear to be alike, but with close inspection you will see small differences that can help to identify a rare stamp. Perforation Gauge - Another tool to help find differences in stamps. The “perf” gauge is a scale used to measure the perforations or ridges along the outside edges of stamps.